Pat chicken dry and liberally salt and pepper the cavity. Place remaining orange quarters, rosemary sprigs, and garlic inside the cavity. Using your fingers, loosen the skin from the meat. Place half of butter mixture underneath the skin. Rub remaining butter on the outside of the chicken. 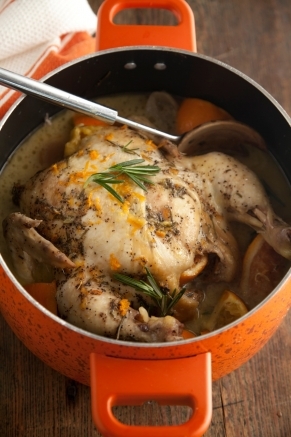 Place chicken on top of orange quarters and lay three orange slices on top of the bird. Cover and cook on low for 8 to 10 hours, or until juices run clear.